A Normal Size, Very Colorful, Exceptionally Well Made Agee Point That Exhibits Surface Aging & Stone Patination, Aging In The Side Notches, Correct Overall Shape And Blade Thinness, Correct Style Blade Flaking, Correct Style Basal Notching, Correct Material And Manufacture For The Area Found. 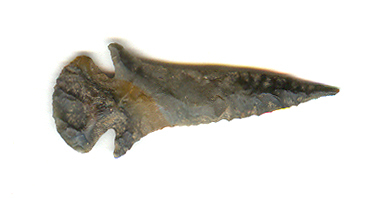 Found By Glen Kizzia In The 1980's As One From A Large Cache Of Ceremonial Arrowpoints Found At The Kidd Site, Pike County, Arkansas. This Is A Rare Example Being In Excellent Condition. Includes A Ken Partain Certificate Of Authenticity!